3.9 out of 5 based on 38 bloggers and 11 commenters. 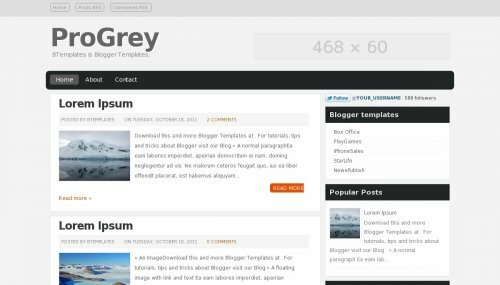 ProGrey is a free blogger template with 2 columns, right sidebar, ads ready, footer columns, social bookmarking icons, posts thumbnails and neutral colors. Este template é adaptado do WordPress? @Wesley: Não. este é o meu conceito original. A clean professional looking template that could be used for any number of business types. @James Smart: Thank You James..
Pq as imagens da primeira pagina ficam comprimidas? Great template, very professional look. Only concern is that how do i get rid of the Twitter follow button and replace it with my own? Great, clean and professional template. Love it. I’m currently using this Template and it’s so nice and clean.